Gently press the Tofu Cube and take out as much water as possible. Press it with a paper towel so that the excess water is absorbed. 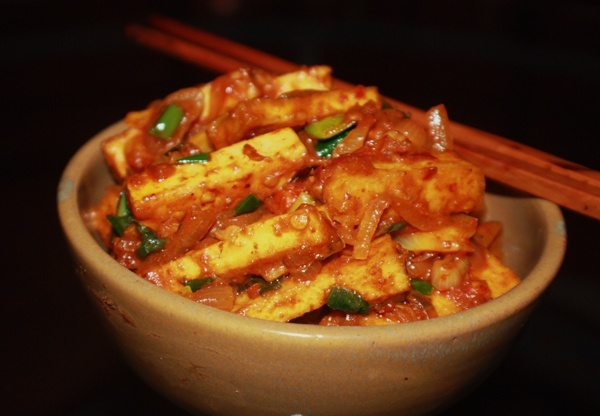 Cut the tofu into cubes or rectangular pieces. Heat 1 tbsp of oil in a non-stick pan, add the tofu pieces ( handle it carefully so that it does not break) and stir fry the tofu on both side for about 2-3 mins till it become light brown. Don’t over fry the tofu as it becomes tough. Drain it on a paper towel and keep it aside. In the same pan add the remaining oil and add the minced garlic, green chillies and sliced onions. Cook for couple of min till the onions become soft. Add the chopped tomatoes, salt, turmeric, chilli powder and cumin powder. Fry for 2 mins. Add 1/2 cup water to the cooked tomatoes & onion and cook for another couple of minutes, till the gravy starts to thicken. Add the chopped scallion, soya sauce, tomato sauce and mix well. Now, add the pan fried tofu pieces and the Timbur powder and coat the to tofu pieces nicely with the gravy. Adjust salt and seasonings. Serve with plain rice or noodles. This entry was posted in All Recipes, Nepali Food Recipes, Tofu and tagged Nepali Cuisine, Nepali Recipes, Spicy Tofu Curry by Kamakshi. Bookmark the permalink. I so want to go back home and cook it as early as possible! I am salivating seeing the picture.. What I love about your recipe is the picture that makes me feel any dish presented here is scrumptious.. Yum.. Yum… can’t wait for the evening! Moni, I am sure it tasted good …. Best part about cooking, you can always adjust an ingredient or two and it becomes your very own dish to suit your style. Happy Cooking !